I’m serious about beans. For many years, I didn’t understand what the big deal was. I used canned beans in my chili and thought they were fine, but nothing to get excited about. Like tofu*, they seemed to be a vehicle for other flavors, not something to enjoy on their own. Then I started cooking them properly from scratch and everything changed. I became a bean girl. What does a bean girl do, besides eat lots of beans? Try to figure out the best way to cook beans and store beans. Bookmark a lot of bean recipes. Spend an inordinate amount of time in the bulk foods aisle at Whole Foods. I’ve soaked, I’ve simmered, I’ve slow-cooked. And I have two favorite methods for cooking beans from scratch; this is the first. If you don’t have a slow cooker, you’ll have to wait for part two. In the meantime, this burning question: To soak or not to soak? I always soak chickpeas — they’re so hard, you have to — and only soak other beans if I happen to think of it either hours or a day before. But let’s speak briefly about the unspeakable: the digestive effects of beans, henceforth referred to as “the toots.” When I am eating beans at least once a week, I am not afflicted by the dreaded toots. Regular intake of fiber seems to keep things running smoothly and, uh, silently. If you aren’t so lucky, there are some who say soaking your beans and discarding the soaking water before cooking will help. With the toots. I hope that answers your question because I’m not going to go into more detail. So what to do with all your lovely, non-gassy, perfectly tender beans? Once cooked, they can be used immediately, or stored, covered in their cooking liquid, in the refrigerator for up to a week or in the freezer for several months. Then they are as convenient as canned beans, but with a better texture and a kajillion times tastier. Many recipes for dishes with from-scratch beans to come. I am a bean girl, after all. * Some other time, I will discuss eating tofu to eat tofu, rather than eating tofu to pretend it is meat. It’s all very Zen. Optional seasonings: bay leaf, thyme, rosemary, garlic, carrot, celery, etc. Quick soak: Put the beans in a pot, cover them with several inches of water, boil them for a couple minutes, then turn off the heat and let them sit for 2-3 hours. Drain. 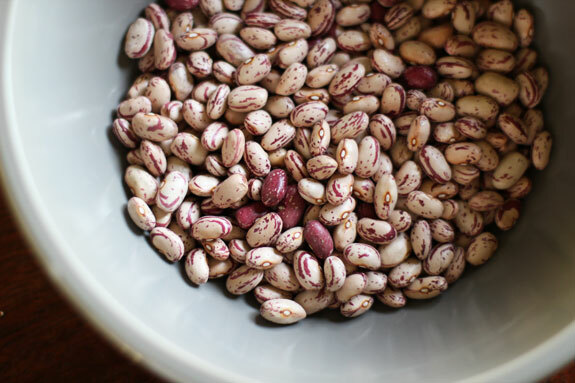 Overnight soak: Put the beans in a large bowl, cover them with several inches of water and let them sit on the counter or in the fridge for 8-24 hours. Drain. Put the beans, 1 teaspoon of salt and optional seasonings in the slow cooker. (I don't chop up ingredients like garlic, carrots or fresh herbs. Keep them whole so they are easier to remove later.) Add enough water to cover by 1/2" if beans are pre-soaked, 1" if beans haven't been soaked. Cook on LOW for 6-12 hours or HIGH for 3-5 hours. Halfway through cooking, add the other teaspoon of salt and stir. If at any point, the beans start poking up out of the liquid, add enough boiling water to cover them again. Here's where I have to get imprecise. Depending on the size and freshness of the beans, whether or not they were soaked, and the position of the moon in relation to Mars, your beans will have a 2- to 6-hour window of doneness. 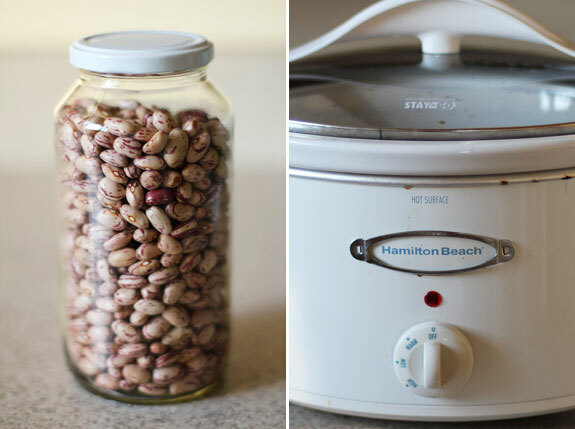 The easiest way to check on the beans is to try one; if it is still grainy or starchy, put the lid back on the slow cooker and check again in an hour. Once you get familiar with a specific bean's cooking time, write it down for the next time you cook them. 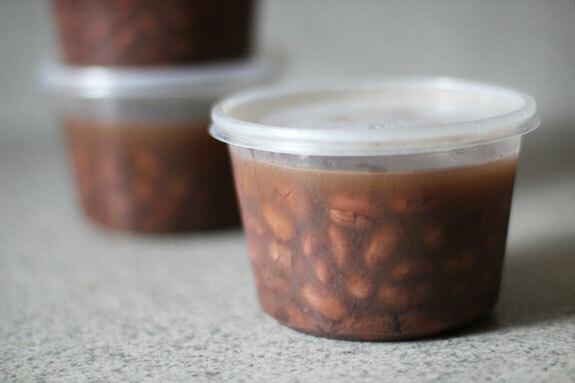 Once cooked, the beans can be stored in a container in their cooking liquid and either refrigerated for up to a week or frozen for several months. (Discard the garlic cloves, bay leaves, or other seasonings.) 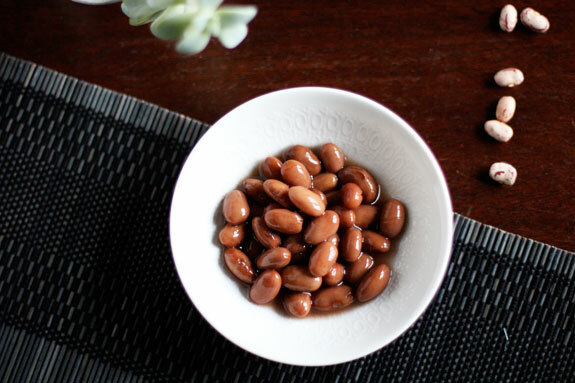 If you're freezing the beans, add 1 teaspoon vinegar to the liquid to keep them from getting mushy. • I like freezing my beans in 2-cup batches, since that is about the amount found in a can of beans. 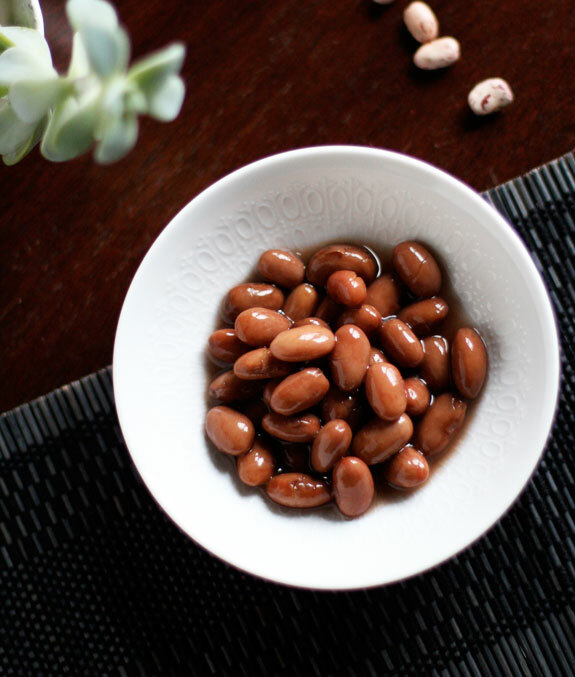 • Bean cooking liquid is flavorful and useful. Don't discard it! • Frozen beans can be thawed in the refrigerator or microwave, or just plopped into a pot over low heat on the stove. this post makes me so happy. can’t wait to cook some toot-less beans in my slow cooker. i’m a bean girl too. just can’t get enough of em!